The WSD HANDA Center for Human Rights and International Justice at Stanford University, in partnership with the East-West Center, has written and published “Justice on Appeal: Commentary on the Case 002/01 Final Judgment at the Extraordinary Chambers in the Courts of Cambodia”, a final summary report with legal analysis of the ECCC Supreme Court Chamber’s Appeal Judgment in the first trial of Nuon Chea and Khieu Samphan. This report — written by the Handa Center’s Dr. David Cohen, Daniel Mattes, and Caitlin McCaffrie — builds on the work of many individuals who consistently monitored and reported on each day of trial proceedings and events prior to the trial’s commencement in 2011. On 23 November 2016, the Supreme Court Chamber (SCC) of the Extraordinary Chambers in the Courts of Cambodia (ECCC) issued its long-awaited final judgment in the first part of the ongoing trial against Nuon Chea and Khieu Samphan, the two surviving senior leaders of the Democratic Kampuchea (DK) regime, which lasted from 17 April 1975 to 6 January 1979. The pronouncement of this final judgment came more than two years after the ECCC Trial Chamber found the two Accused guilty of crimes against humanity, and sentenced them both to life in prison. In contrast to the Case 002/01 Trial Judgment, the Appeal Judgment succinctly weighs the evidence to determine the validity of the numerous grounds of appeal put forward by the Defense Teams. Where the initial judgment was criticized for its disorderly structure, lack of analysis of the evidence presented by parties, and vague reasoning, the Appeal Judgment offers clarity and sound argument. Although it failed to fully resolve issues surrounding the legal concept of Joint Criminal Enterprise (JCE), the Appeal Judgment identified and addressed a significant number of errors of fact and law. It overturned some convictions, perhaps most notably by throwing out findings of the Accused’s criminal responsibility for the executions at Tuol Po Chrey. 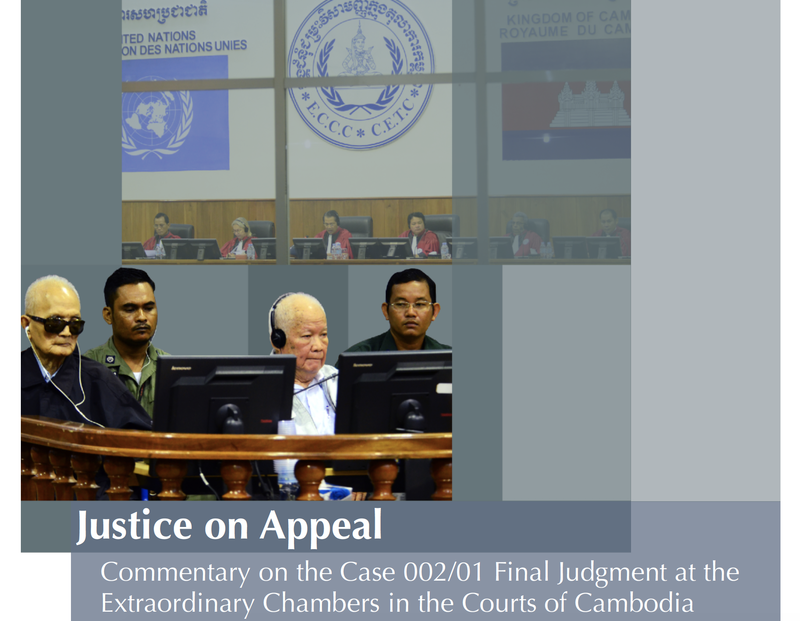 The well-reasoned and balanced final judgment sets a positive example for the Cambodian domestic court system and other international tribunals, while also hopefully raising the standard of production for the Trial Chamber’s pending judgment in Case 002/02. For the full 27-page report, see here.